Are you a bookmark kind of person? I am curious. Are you the type of person to use a bookmark? Do you just memorize the page number? Or, do you dog ear the pages? I have quite the collection of bookmarks, yet I never use any of them! 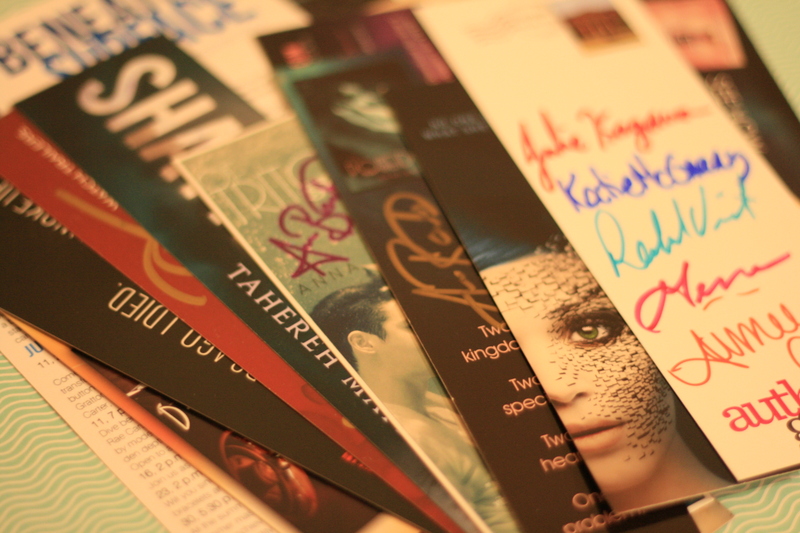 They are really nice ones too, from the many author visits I’ve attended. I typically just look at the page number before closing my book. Bookmarks are such a hassle, but then again, so is having to remember where you left off. Do any of you do this too? How do you keep track of your place whilst reading? Do you have any super cool bookmarks? I would love to hear all about it! Want more discussion posts? Click on my Discussions category over to the right side bar, or head on over to Oh, Chrys or The Fiction Conniption to discover new and exciting topics. I recently reorganized my bookshelf, so I figured now would be the perfect time to give you a tour of (at least one) bookshelf of mine! 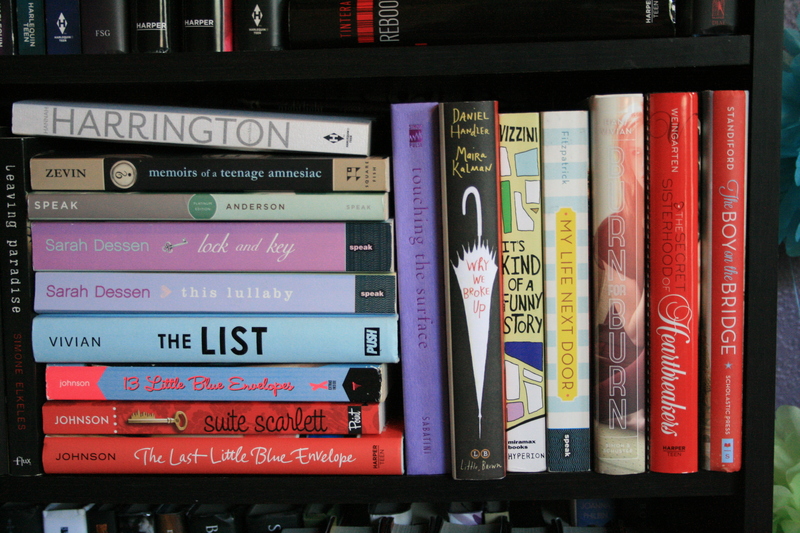 This is my main bookshelf – where I put all of my recent purchases/favorites/books with the prettiest covers. Top Shelf: Here I have my “bestsellers”. Books on the top shelf are some of my personal favorites. Towards the right of the shelf, I start moving on to dystopians/apocalyptic-style books. Some books from this shelf include Jellicoe Road, Shatter Me, Froi of the Exiles, and Lola and the Boy Next Door. 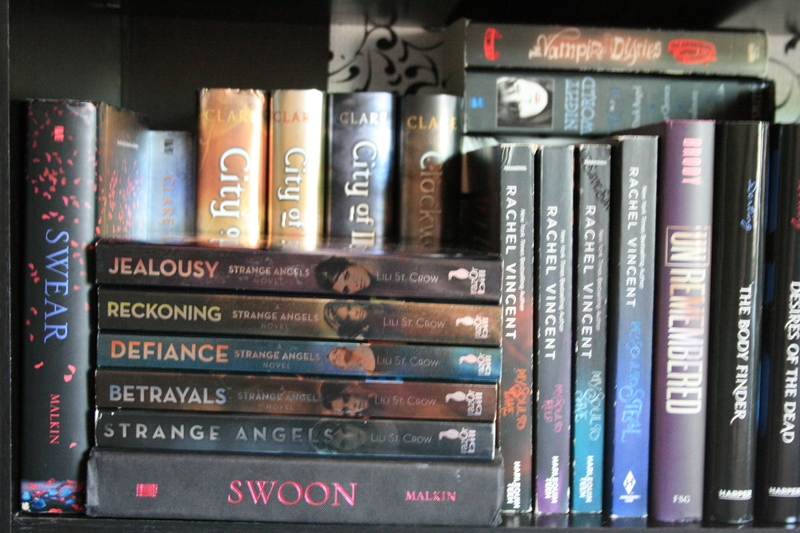 2nd Shelf: Featured here are my paranormal romances. It is definitely the genre in which I have the most books. The Strange Angels series, Wolves of Mercy Falls series, and Between the Devil and the Deep Blue Sea are all on this shelf. 3rd Shelf: Now we start reaching my contemporary shelf (with some paranormals hiding behind them. When stacking this shelf I realized that I like contemporaries more than I thought I did. Have any recommendations for me? (I made one for you here.) On this shelf I have books like Speechless, My Life Next Door, and Perfect Chemistry. 4th Shelf: Moving on, I have my fantasy/historical/retelling shelf. This shelf is a bit lacking. I like fantasy and some historical, but I am usually to afraid to buy those books for fear of not liking them. I usually just get them from the library. Graceling, A Great and Terrible Beauty, and Grave Mercy live on this shelf. 5th Shelf (not pictured): I primarily have any miscellaneous books on this shelf. I have yearbooks and a few movies residing here too. One notable series on this shelf is The Mediator series by Meg Cabot. Those books are so much fun. Kindle: Not to be left out, I also have at least another forty books on my handy-dandy Kindle. Typically e-books that have gone on sale live in my Kindle. One series I have on here is The Elementals by Brigid Kemmerer. Other Bookshelf: I have another smaller bookshelf that contains another 50-100 books. The books on here are ones I’ve borrowed, read for school, are weird sizes, or didn’t like. This shelf is a little bare and has some other things on it, so I didn’t take a picture of it. My reorganization process was quite fun. 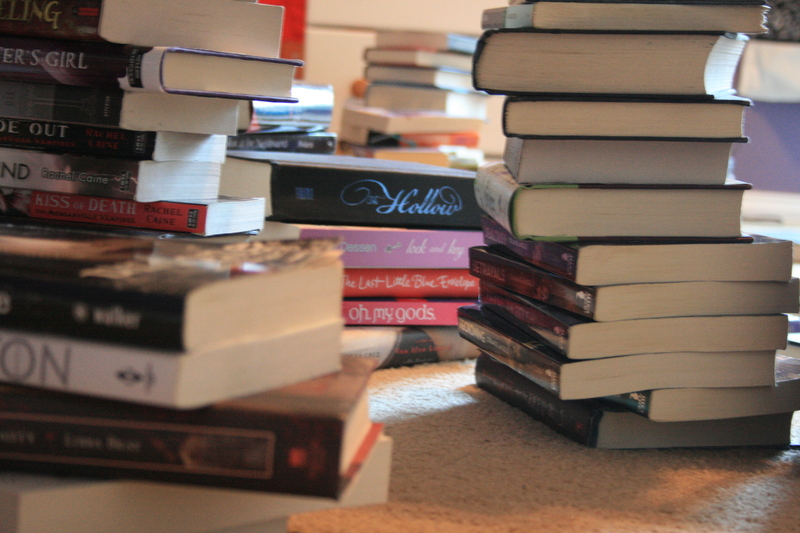 I took off all the books from my shelf and had towering piles littering my floor. I decided to organize my shelves based on genre, as last time there was absolutely no organization whatsoever. I picked books out genre by genre and fit them like puzzle pieces on the shelf. I would turn them this way and that to make them fit. By doing this I made more room, which was also my goal all along. So that’s my bookshelf! What does yours look like? How many books do we have in common? 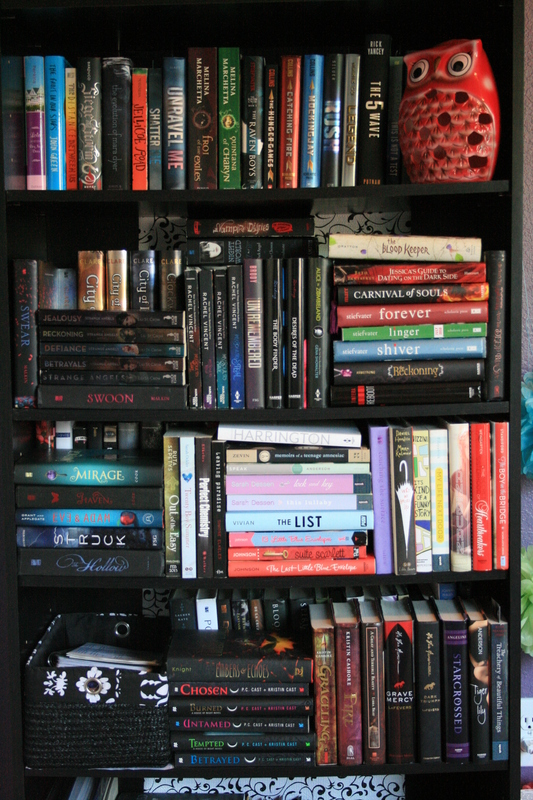 What is your dream bookshelf? I love hearing about others’ shelves, so be sure to let me know!